The ability to perform large scale data analysis may require computational capacity not found on a personal computing environment. Thus, SPARTA is capable of running in the cloud or on high performance computing environments. In the subsequent tutorial, we describe the analysis process of computing differentially expressed genes using SPARTA and the provided ExampleData in the cloud with Amazon EC2. From here you will need to enter your credit card information so that if you decide to go beyond the “Free tier” machines, they can charge you (computing time, even on large machines is pretty cheap). Also, you will need to verify your information and select a support plan that suites you. Navigate to the AWS site. For working with the ExampleData we do not need significant hardware capacity, so for now, select the t2.micro instance type (red box). However, if you would like to analyze your own data, either the m4.large or m4.xlarge instance types are reasonable (blue box; these instances will charge you per hour, though are quite cheap). Then, click on “Review and Launch” (orange box). Create a new key pair and name it “SPARTA-example” (no quotes; red arrow). Then click on “Download Key Pair”. Save this .pem file. After you download and save your .pem file, click on the “Launch Instances” button. Select the “View Instances” button and wait until your “Instance State” turns green. Copy and paste the “Public DNS” into a text document (e.g. TextEdit or Notepad) and save it. This is your Amazon EC2 machine and you will need this to log into it. To log into the machine you just created, we need to use the .pem file and the Terminal. If you don’t remember how to get to the terminal, see the image in the Introduction in either the Mac OS X tutorial or Linux tutorial. 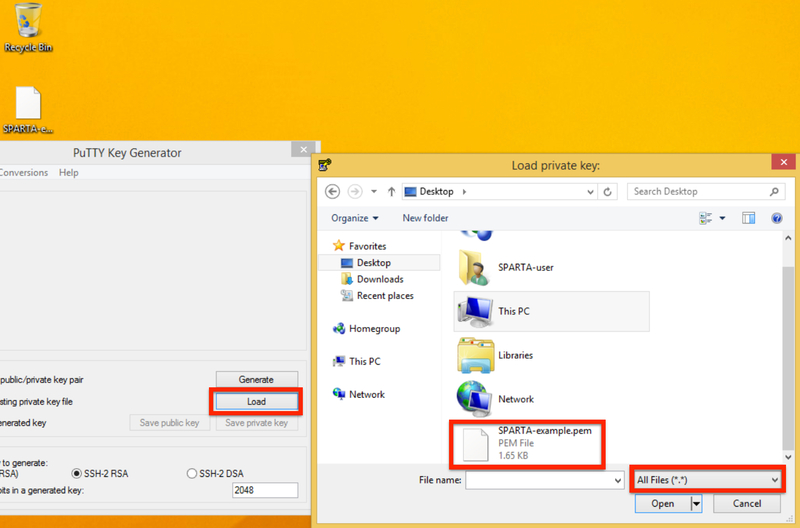 Move the .pem file from your Downloads folder to your Desktop for the time being. Now, let’s log into our machine! 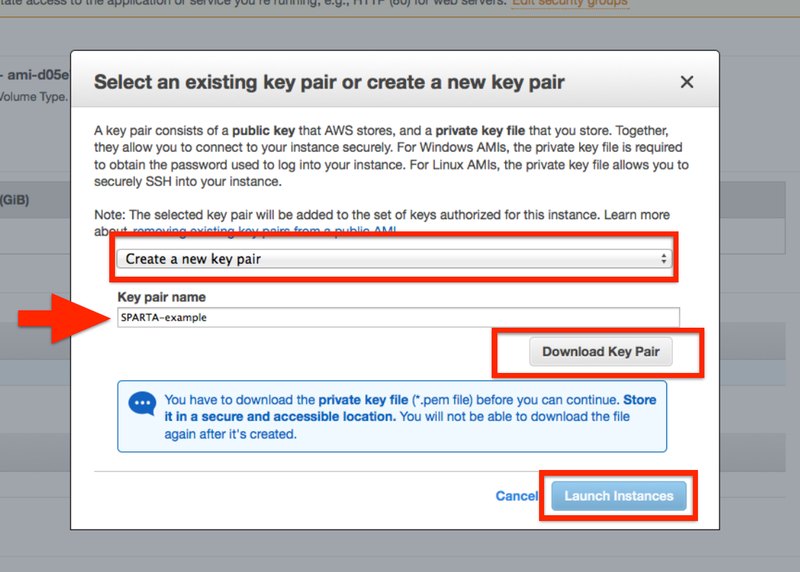 What you are doing is logging in using the secure shell (ssh) command with your credentials in the .pem file as the user ‘ubuntu’ to the machine ‘ec2-...-compute-1.amazonaws.com’. Congratulations! You’re now on the cloud computer that you launched earlier! To log into the machine you just created, we need to use the .pem file, a key generator called PuTTYgen, and a secure shell (ssh) client called PuTTY. 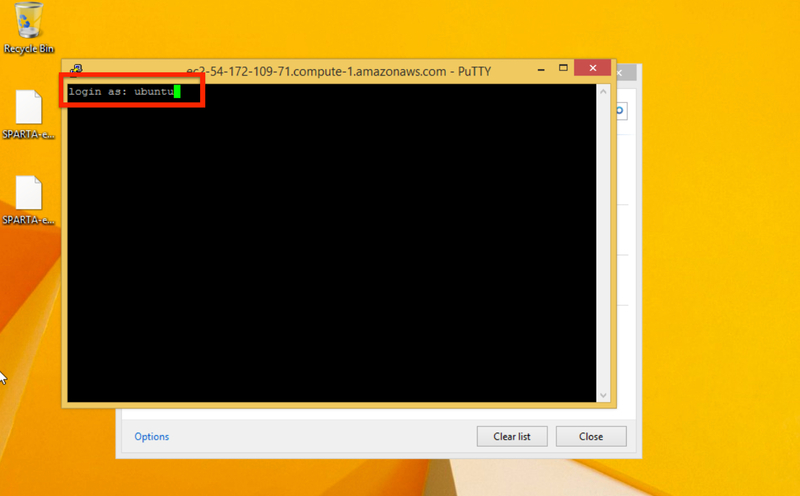 Download PuTTY and PuTTYgen from here. 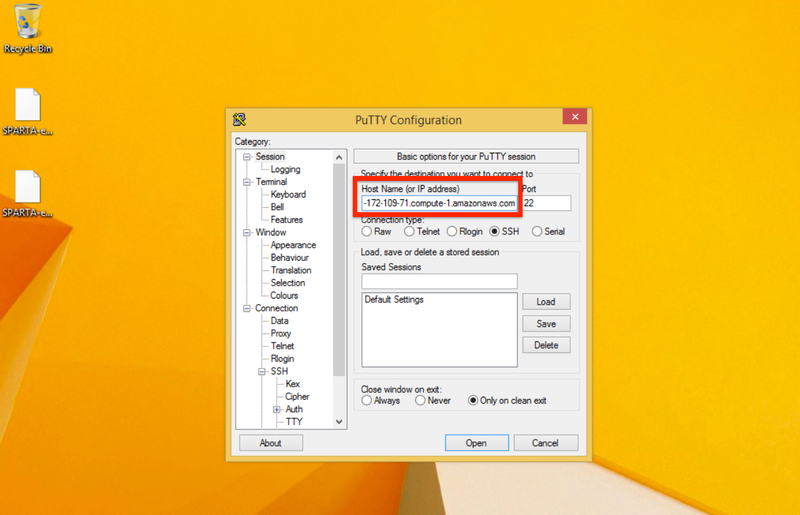 Open up PuTTYgen and click on “Load”. Navigate to your Desktop and select the SPARTA-example.pem, click “Open”. 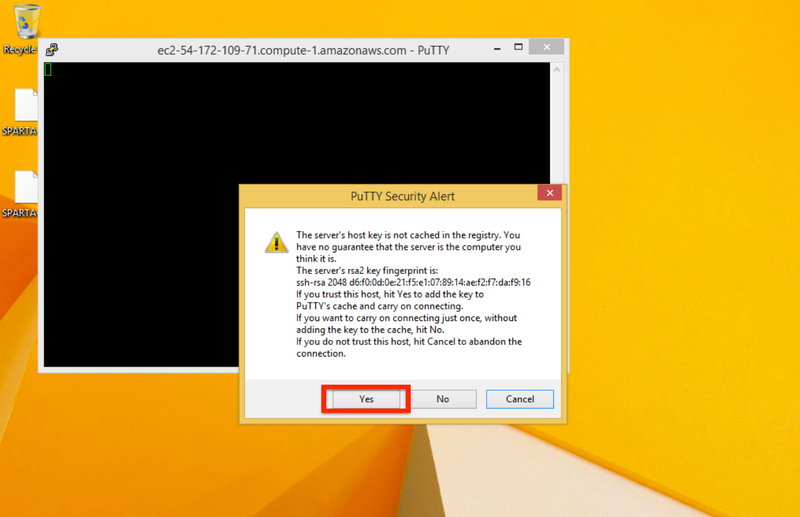 PuTTY should present you with a window that says something like “Successfully imported private key...” It also states in the window that we need to use the “Save private key” command. So, let’s do just that. Click on “Save private key”. Save it somewhere you know where it is (reasonably easy to find is always a good idea) It may ask you if you want to save it without a passphrase. Click “Yes”. Save it as “SPARTA-example” on the Desktop (no quotes). To do this, we will need to open up PuTTY (not PuTTYgen, which is what we were just using). Enter the Host Name (public DNS from earlier) into the “Host Name” box. Look in the Category section (left-hand side of the window) and navigate to the SSH section (about halfway down the list). Click on “Auth” in the SSH category and add your PuTTYgen key (ppk) you just made by clicking on “Browse” and selecting the ppk file. Now click “Open”. The first time you log into a new machine, it may prompt you with a window similar to the one below. This is verifying the RSA fingerprint of the machine. Click “Yes”. 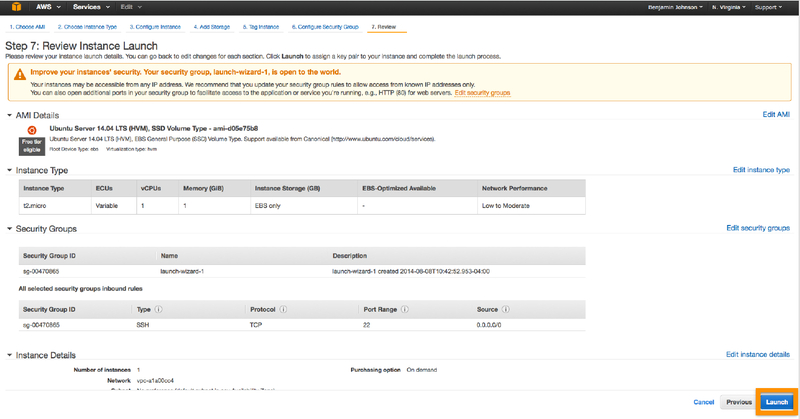 Now that we are logged into our Amazon EC2 machine, let’s start analyzing the ExampleData that comes with SPARTA. Now, we need to edit the ConfigFile.txt within SPARTA_Linux to run the workflow in non-interactive mode. The ConfigFile.txt should be displayed before you. You cannot use your mouse to move the cursor around, but you can use the arrow keys. Navigate down to the bottom where the experimental conditions input is. To compare all four of the experimental conditions in the ExampleData, we need to add two more lines below “Experimental_condition_2_files:”. This is for 4 conditions. Now, we need to add in the file names. At this point in the analysis, the file names will have a prefix called “map” and an extension called ”.sam”. So, based on the names of our input data, we can type in the file names with the appropriate prefix and extension. To save the file, hit the Control key and “O” (not the number zero). Hit enter/return. To exit the editor, hit the Control key and “X”. From here, the analysis will proceed from QC, aligning, counting, and differential gene expression. Congratulations! You’ve analyzed the ExampleData in the cloud! You can use a client called WinSCP. Click on the “Installation package” under “Download WinSCP” to initiate the download. Follow the installer and just use the default settings. 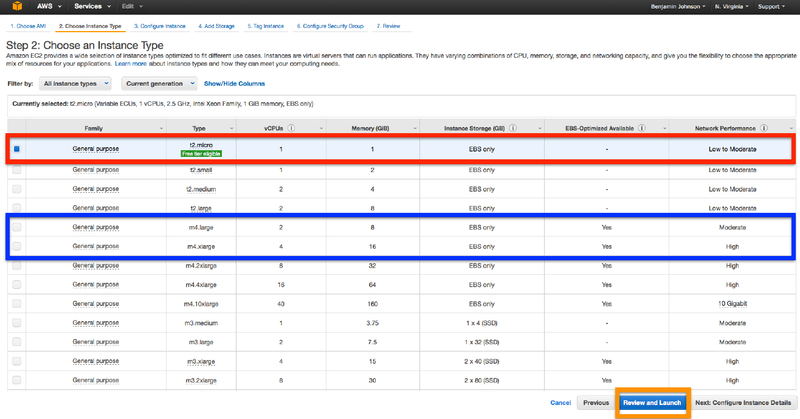 Now, you can transfer files, to and from your local machine and the EC2 machine!